The following piece is quite formal. Before I start sharing trades and analysis on this blog I wanted to provide an insight into my interpretation of behavioural macro trading. In which case I won’t have to unnecessarily elaborate when I work through my process in later posts. Apologies if this is TL;DR.
Our brains are in constant disharmony, a contest between two conflicting forces. The first force is emotion. Emotion, can be both wondrous and destructive. Primarily because it is a characteristically primal, subjective and intrinsically hard-wired system that operates on an intuitive autopilot. The second force, logic, is less primal in nature due to its extrinsic abstract qualities and typically requires purposeful effort in order to reason objectively. These two forces are asynchronous and so, remain in perpetual disunity, with one often contradicting the other, e.g. the platitude “my head says one thing, my heart another”. Even when we attempt to reason as objectively as possible, emotion interferes in the process, resulting in an outcome intertwined with our instinctive emotional biases. Hence, this inherent predisposition to faulty reasoning – to be a slave to our passions – our fallibility; was regarded as the manipulative function by George Soros. Nb. Not only do we manipulate reality, but also our understanding of it. Neurologically speaking, the Neocortex, the part of the brain considered responsible for objective decision making; cannot reason without being influenced by the Amygdala, considered responsible for subjective emotional function. The Amygdala is given priority in the brain over the Neocortex. As a result, one’s opinion tends to feel in an ill-reasoned, preconceived manner that was likely subsconsciously, and then consciously; constructed long before it was considered rationally. A curious function from an evolutionary biology perspective of our lizard brain attempting to keep us out of danger. As information comes in, our subjective emotion is constantly undermining and contaminating our process of reason. This reflexive propensity influences all people differently. Yet, this is only the beginning of how we fail to logically reason. Nb. I’ve left out the discussion on hormonal effects on cognition and behaviour as it’s worth its own post entirely. Check out John Coates book linked below in Further Reading to jump start on the topic. In Thinking Fast and Slow, the eminent psychologist Daniel Kahneman separates how we process information into two systems. We have an instantaneous, intuitive and instinctive System 1, and a deliberate cognitive system, which is (hopefully) logical and rational, System 2. System 1 is automatic, stereotypic and subconscious. It is no surprise then that it’s function is most closely associated with the Amygdala. System 2 is the one we call upon for problem solving and strategic thinking, it requires a lot of energy via concentration. Depending on one’s familiarity with the problem at hand, System 2 takes a conscious effort to recruit, thus straining our finite capacity for logical effort. Due to the effortful nature of System 2 and a finite capacity for abstract logic, we tend to take shortcuts. It’s hypothesised this is due to our reasoning faculties being a more recent evolutionary adaptation. Nevertheless, what we do know is the shortcuts we take. By being aware of these shortcuts and giving them a taxonomy, perhaps we can (hopefully) better recognise them in others, and, even better, give ourselves the tools to introspectively critique our own reasoning. Now we’ve covered the neuropsychological conditions which make us prone to failures in our reasoning, let’s look at some of the tendencies which result in the human brain drawing incorrect conclusions. 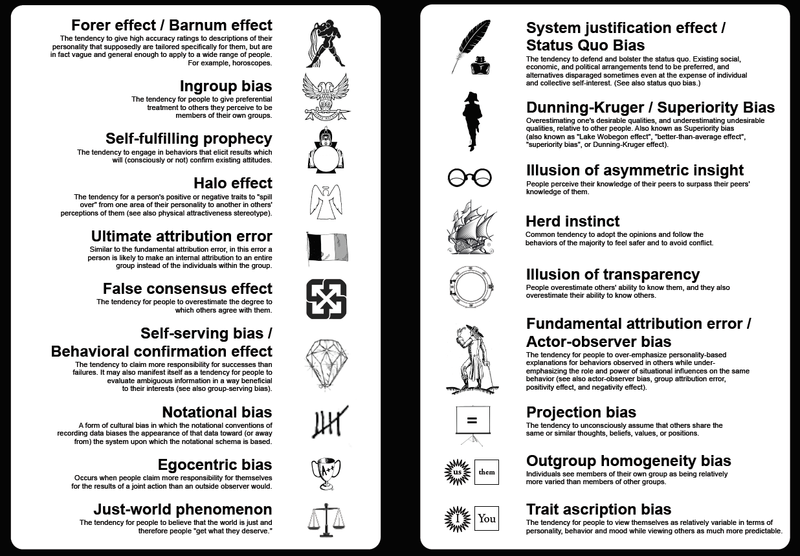 Cognitive biases are patterns in perceptual distortion that are replicable and responsible for misjudgement and illogical observation. There’s a vast array of examples for these spanning both human interaction (social biases) and judgement (memory and decision making biases). Cognitive biases arise when emotion, coupled with the rapid-fire nature of the lizard brain; result in heuristics applied outside the bounds of reason. Biases in professional trading and investing have been well documented since Keynes’ beauty contest and they are worthy of an entire tome themselves, so I only gloss over some key ones in this piece with the below examples. 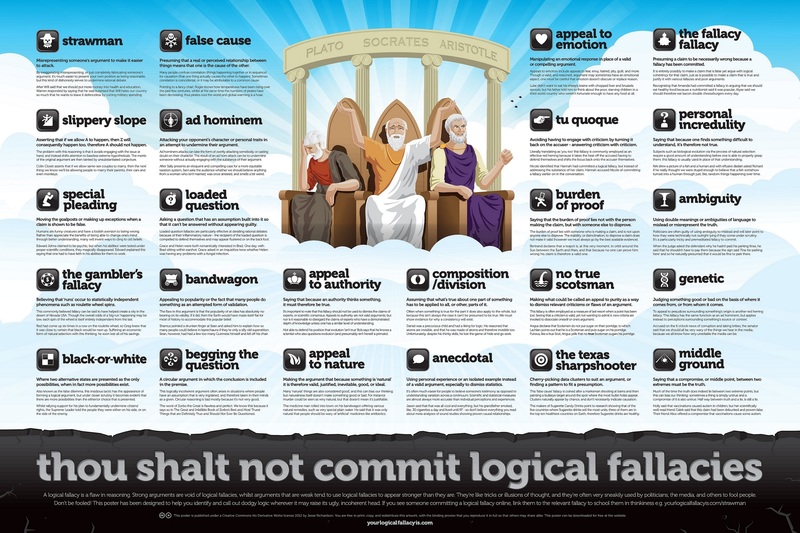 Logical fallacies are errors in logic, they can be formal violations of propositional logic or informal fallacies whose content or argument requires a leap in logic, leaving a disconnect between one’s premise and resulting conclusion. Most commonly these are inappropriate generalisations. Another great graphic with some examples below. Reasoning by association, substitution or analogy, is an example of an inappropriate generalisation, a mistake humans often employ to shortcut the effortful process of recruiting System 2. When we find a false equivalency, we rather conveniently do not have to distill a problem to its first principles and reason out from there. Instead we are trusting the logic of the analogy; something that works well in our memory, which is typically associative, but less so in logical propositions. An axiom is a starting point for a logical proposition, generally so evident that it is presumed true without skeptical inquiry. Axiomatic thinking is valuable when one has successfully identified a first principle, but disastrous when patently false. e.g. The Fed’s monetary policy will lead to inflation. In this false axiom, there’s a substitution between a bias about a contingent event, with an objective first principle; invariably perceiving it as given. i.e. Given A then B. It is no surprise then, that this was likely undertaken in an attempt to reason quicker and probably done emotively and subconciously before being rationally considered by System 2. A curious commonality in these types of misjudgements is that they generally stem from an ideology, be it political, economic or religious; all are likely to incite and galvanize emotion. Michael Marcus’ quote above is a pertinent example of one’s political ideology impacting their decision making. In investing and trading this can be both help and hindrance. I’ve included a small survey out of curiosity to see if Michael Marcus’ observation held true in recent beliefs about the outcome of Quantitative Easing (QE). The hypothesis being: is the right more prone to an inflationist belief because of a political ideology espousing smaller government? Please check the box which best describes you. I’m Australian so forgive me if this seems a little politically insensitive. In this way, we can ascribe a typology to ideas held by market participants and treat these ideal type generalisations as hypotheses when making investment decisions of our own. By considering sentiment and psychology and working out which story, or ideal type is the most powerful in the contest between bulls and bears, as traders we are better equipped to handle the pendular swing of sentiment and positioning in markets, such that we may have a better chance to predict and profit from the dynamic price movements and volatility in financial markets. Giving these hypotheses the treatment of scientific falsification, we prevent ourselves from making the mistake of getting wedded to false axioms. The anatomy of the gold bug is the home-ground for behavioural macro analysis. As noted by Jack Schwager, given that gold is the only commodity whose supply is completely unrelated to the amount physically used there is no rational economically derived fundamental logic to explain the price movements in the commodity, it is simply a function of what people are willing to pay and that is determined by their expectations, which are likely biased by their political and economic ideology and emotion. The antidote is to consider gold mechanistically; in terms of the market’s positioning, and behaviourally; in terms of sentiment, story and expectations. Sadly, this is not what happens in practice. Logic is suspended as participants are influenced by their axiomatic beliefs. The right wing guy with the house in the country who owns guns and gold and is fearful of big government and inflation, as an extension of the Michael Marcus archetype; takes it as a given that inflation will be created by the profligate government without questioning the fundamental logic of that axiom. Instead, he’s thinking about something which is contingent as though it is a given and not distilling the observation to first principles… because it was easier to skip that part. You will come across many professional traders who will point out the disparity between paper trading and the real thing, this is because when paper trading you haven’t had the market test your nerve. That’s before accounting for the emotional difficulty one may face when it comes to changing one’s mind. Consider the generic chart for gold below. This chart represents one of the greatest displays of emotions in trading. Indeed anyone who trades derivatives or understands the Greeks knows that it’s more complex than simply buyers and sellers. However, resistance and support keep occurring in the same ranges outlined in red for a reason, as Mark Dow smartly put it: “the behaviour behind resistance, of course, is the old I’ll-sell-it-when-it-gets-back-to-where-I-bought-it”, or vice versa. Indeed, we can see how emotion is driving this process. For example, imagine your bias is to be bearish – you are more confident that you are correct when reality, read price, accords with your thesis, and conversely, less confident when it looks to be challenging resistance and doesn’t confirm your thesis. If you try to short gold when it makes a new low and it fails to break down, you stop out of your position as your fear response kicks in and the Amygdala or System 1, overrules the logic that justified your trade. Thus, there’s an upward force on price and the continuum of reflexive feedback between price and conviction continues. Similarly, the bulls begin to develop confidence when the price appears to be breaking higher, and when it fails, their System 1 interferes and they hit their stops, and the process repeats. This occurs across various macro horizons. Above we can see it occurring in the course of months, but it also transpires in every timeframe, from intraday moves to the course of years. For example, take gold’s long slow march from its early 2000’s base, to its eventual sharp acceleration and blow off top. In longer term cycles, the pendular swing might be slower, and the bulls might have had the power for longer, but the process is still the same. Once the self-reinforcing positive feedback between price and participants behaviour is extinguished by the bubble bursting, the virtuous circularity becomes vicious. Ultimately, we can see the neuropsychological contest of emotion and logic not only occurs internally for market participants, but is also represented collectively through price action in markets, where we observe a contest of ideas represented by the participants willingness to risk capital on those ideas, reflective of their strength of conviction. The more people are convinced, the greater the emotional conviction, the stronger the idea and the more likely it is a meaningful move, or potentially, a bubble will develop. Most notably, it is often these illogical cult-like axiomatic beliefs which empower people to risk the most capital with the greatest conviction. Numerous newsletter writers on the internet, charging a $20p/m fee are incentivised to cater that, to paraphrase Kahneman: “A reliable way of making people believe in falsehoods is frequent repetition, because familiarity is not easily distinguished from truth”. Ultimately, embracing mistakes and critical thinking (ex-ante and ex-post) are the only tonic to assist us with rationality. Nevertheless, it’s easier said than done, particularly in markets. Let’s see how you behave when you have your money on the line!